I suppose the simplistic description of Replicator would place them in the college rock or "alternative rock" category. The promo sheet mentions "staccato rock", which "refers to the short clear-cut tones and chords that make up the largest portion of the music's driving sound". Can't say I've heard that term. But what did grab my attention is Replicator's ability to crank out fairly sophisticated patterns and shifting rhythms within the context of what on the surface might seem like basic bashing and crashing rock. From the California Bay area, the band consists of Conan Neutron on guitar, tape loops, and vocals, Chris Bolig on drums, and Dan Kennedy on bass (since replaced by Benjamin Adrian). Winterval is their first CD. Replicator do have elements of psychedelia and spaciness in their music which I noted on the opening track, "(No More) Salted Beef". It's an interesting combination of college rock and wall-of-noise punky garage psychy surf rock. A steady, slowly repetitive ethereal pattern is set by the guitar, bass, and marimba, only to explode in a sonic assault. And it quickly becomes apparent as the CD progresses that alternating between the melodic and the furious is a Replicator trademark, one they balance quite well. Another standout track is "Journey To The End Of The Night Part 2", a simple rocker with a lo-fi Pink Floyd "Wish You Were Here" sound, though Conan's ebow adds a trippy element to the music. 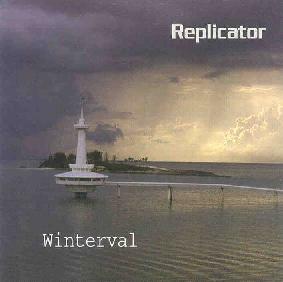 But as Replicator seem wont to do they soon throw up the wall of noise-psych, quite successfully infusing high levels of aggression while still caressing the listener they've lulled into a dreamy state. "Strategy" is a dark and doomy tune I enjoyed, but is also oddly new wavish and a bit garage psychedelic. And "Taxi Driving" is a drifting ethereal instrumental with a drugged, semi-dissonant piano melody, trippy ebow, and freaky droning loops. The remaining tracks are solid rockers, though I have to say I enjoyed the instrumental tracks more than the ones with vocals. But the music always shines through brightly even on vocal tracks, particularly on "Motivationally Challenged" and "Will C. Wood", probably the tracks with the most intricate chord patterns and shifting rhythms. Interesting stuff. I hope to hear more from Replicator. Contact via snail mail c/o Replicator; PO Box 224; Berkeley, CA 94704.